Whoever stole the gift to Neil Armstrong left behind a moon rock worth millions of dollars to a collector. 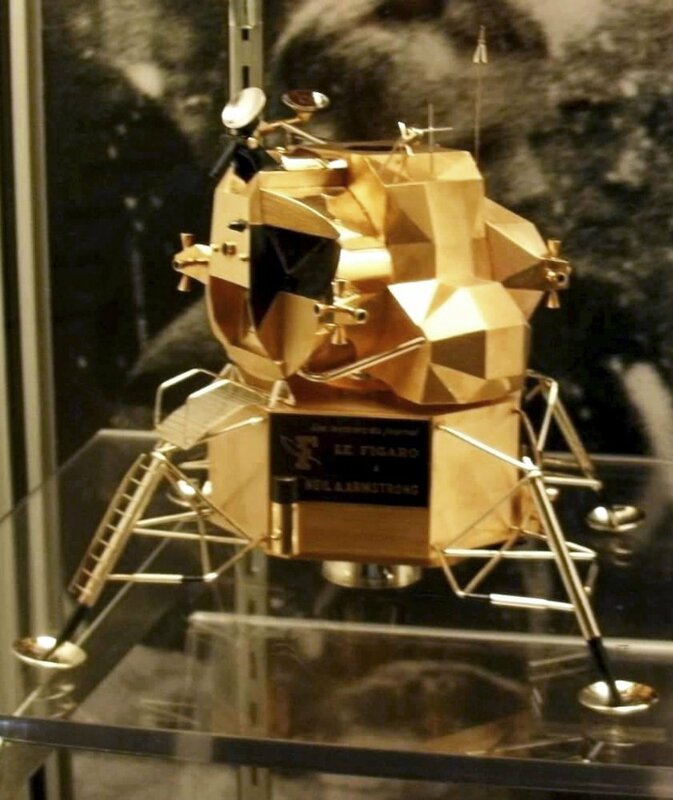 CLEVELAND — Whoever broke into an Ohio museum and stole a solid-gold replica of the Apollo 11 lunar module likely intends to melt it down for the value of the gold instead of trying to sell what could be a collectible worth millions of dollars, said a retired NASA agent who has helped recover stolen moon rocks worth millions of dollars. The 5-inch-high replica was discovered stolen after an alarm sounded just before midnight Friday at the Armstrong Air and Space Museum in Wapakoneta, the boyhood home of astronaut Neil Armstrong, who became the first person to set foot on the moon in July 1969. Replicas made by the French jeweler Cartier were presented to Armstrong and fellow Apollo 11 space voyagers Buzz Aldrin and Michael Collins in Paris shortly after they returned to Earth. The NASA agent, Joseph Gutheinz Jr., noted the thief or thieves left behind a moon rock from the Apollo 11 mission that’s much larger than other rocks given away or loaned to museums or foreign countries. It could easily be smuggled out of the country, where a geologist could verify its authenticity, he said, and it would be worth millions of dollars to a collector of space items. Gutheinz ran an undercover sting operation in 1998 that led to the recovery of a moon rock from the Apollo 17 mission originally given to the Honduran government. The seller offered the rock to Gutheinz for $5 million. Now an attorney in Texas, he more recently has led a group of criminal justice students from the University Phoenix in a project that has identified 79 missing lunar samples and rocks from the Apollo 11 and Apollo 17 missions. A lunar collection bag Armstrong carried on the moon sold for $1.8 million, a value enhanced by tiny amounts of moon dust engrained in the bag, at an auction of space items earlier this month at Sotheby’s in New York. It’s unclear how much gold the replica contains. The FBI and Ohio Bureau of Criminal Investigation are assisting Wapakoneta police in the theft investigation. Police have said they aren’t able to place a value on the replica lunar module. No updates on the investigation have been released and authorities haven’t said whether there were surveillance cameras in or around the museum that might have recorded the theft. Armstrong died in 2012 at the age of 82.